The first thing Lisa, my sister, and I did was to pick an invitation. The invitation really set the entire baby shower’s overall theme and look. I partnered with Minted on this Modern Woodland themed Baby Shower, so the gorgeous invitation options were endless. 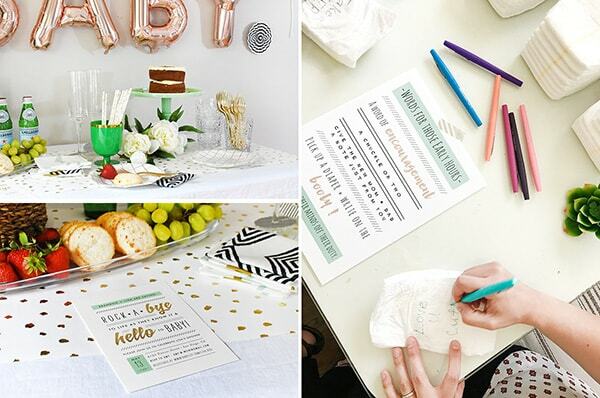 We were able to narrow it down to the Rockabye + Hello Invitation in black, white, gold and mint. The colors were pretty much set at that point and this fun baby shower started to take shape! And how precious is that little sis of mine?!! 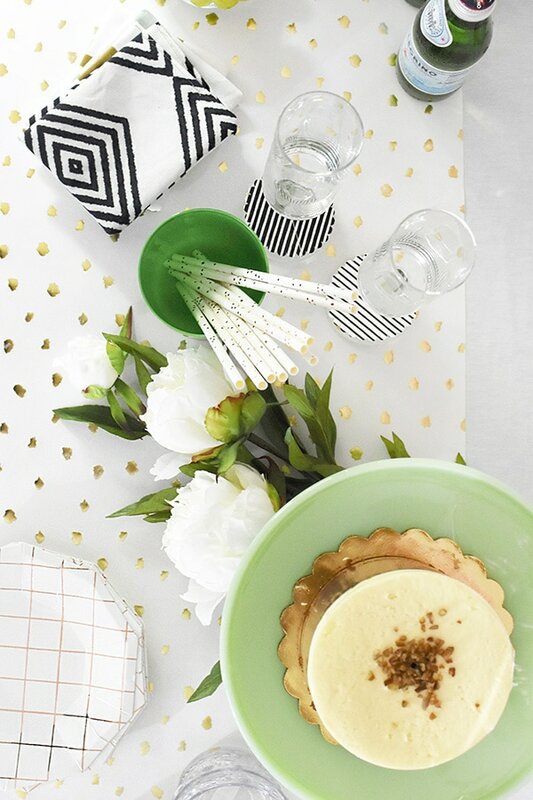 I used Minted’s Modern Mint paper party decor, as the colors and patterns went perfectly with our theme. 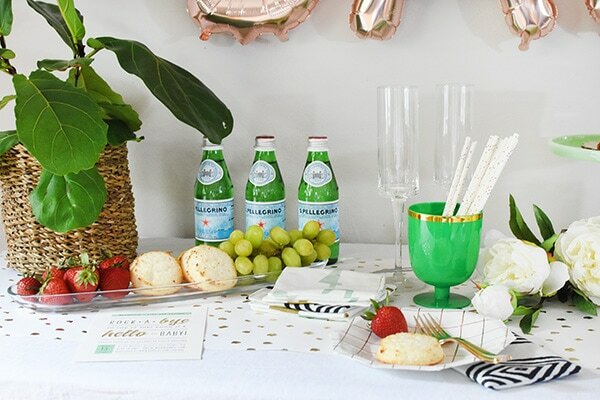 Their garlands help bring any party to the next level. 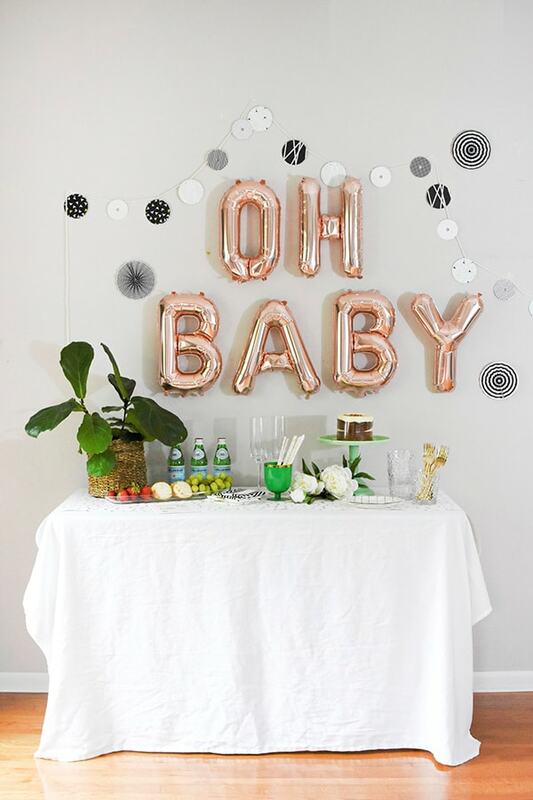 And this script baby balloon was the perfect touch to the room. A longtime friend, Megan of Hayesy Kitchen, helped with this beautiful drink station. 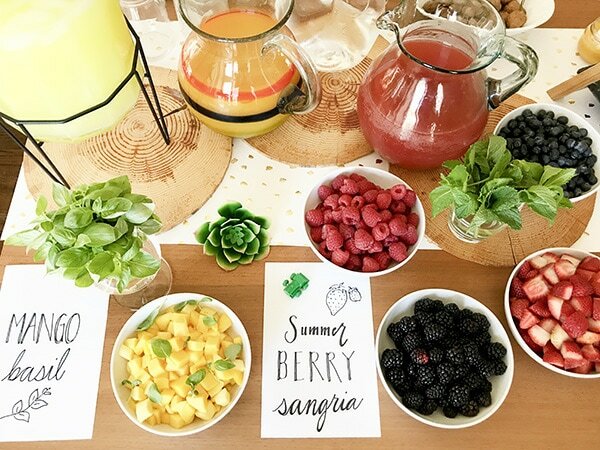 She set up all the ingredients for two delicious make-your-own sangria recipes! One was Mango with basil and white wine, while the other was a refreshing Summer Berry Sangria with white wine. Both were such a hit and looked so lovely filled with fruit and fresh herbs. How fun are those wood slice placemats? They go so perfectly with our Modern Woodland themed. 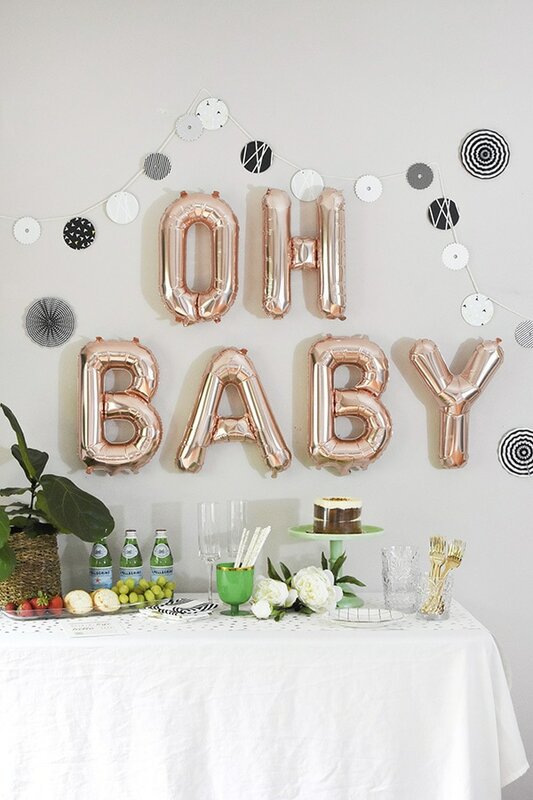 I’m loving self inflatable balloons and this OH BABY was used in another space. They are so convenient and you don’t even need a balloon tank to inflate them. 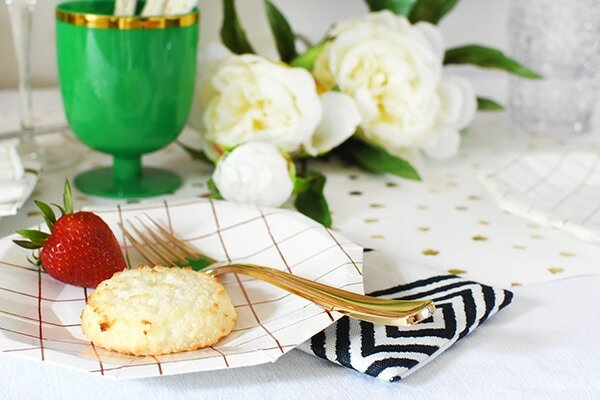 I used a paper Gold + White polka dot table runner as the base for the tables. It’s such a durable heavy weight paper, that it can be saved and used again. 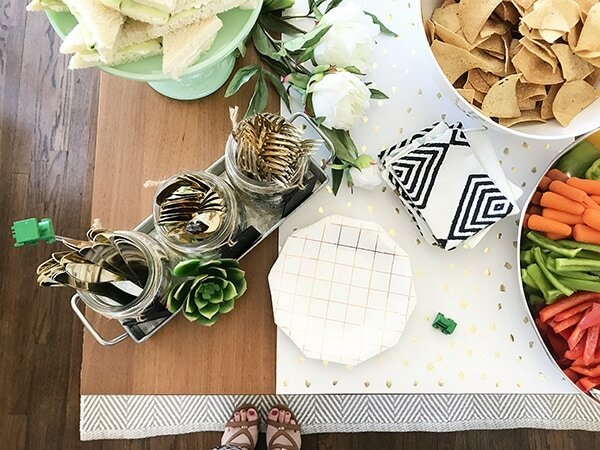 And I’m such a fan of Minted’s fabric line that I always try to find coordinating fabrics and sew them into simple cocktail napkins. I fell deeply in love with these three fabrics – one, two, three. A few of Lisa’s sweet friends helped with filling our table with food! 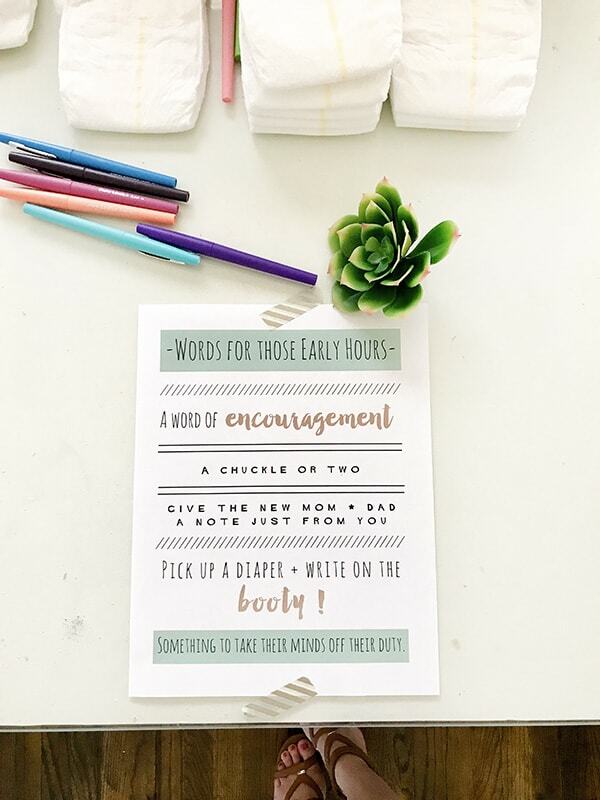 We also had a diaper message station for guests to write notes of encouragement or something silly for those late night diaper changes. Small Grid Plates were added, along with gold plastic cutlery to our food table. And what kind of baby shower would it be without cake! 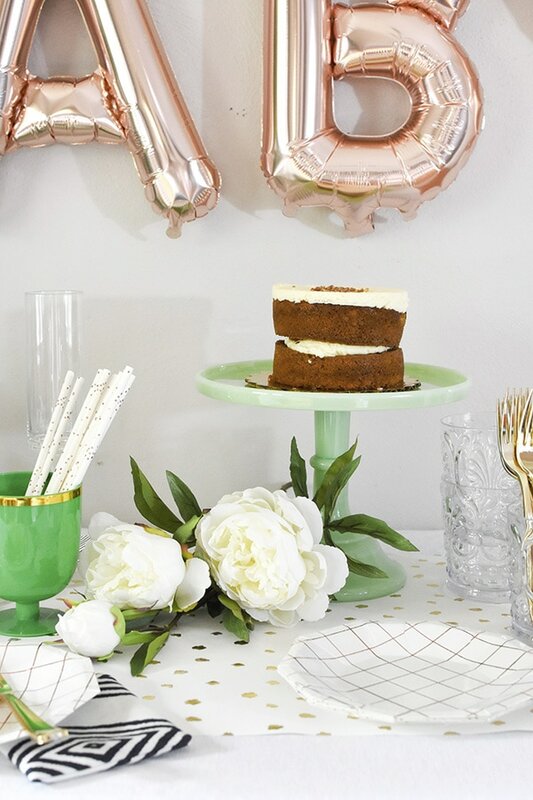 This gorgeous Mint Green Milk Glass Cake plate really set it apart. There was so much love and joy in celebration of Lisa’s little babe that day. Many tears were shed (mostly by Lisa and I) but they were all happy tears! Thank you to Minted for providing product for this wonderful occasion. All opinions are 100% mine. To shop this fun party, check out the links below. Thanks so much, Holly! Yes, I actually just used double stick tape. The balloons are very light weight and it quite easy to get them to stay up there. 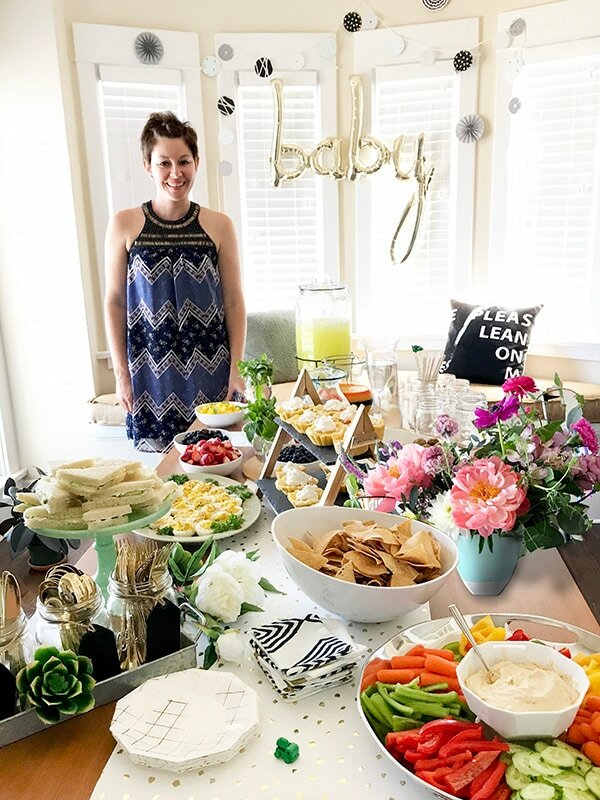 What a sweet baby shower! I told my friend the other day that she has to have a baby so I can plan another shower (because they’re just so fun!). Sadly she just laughed. I love the writing notes on diapers! That is so cute!! Love how simple and beautiful this is. 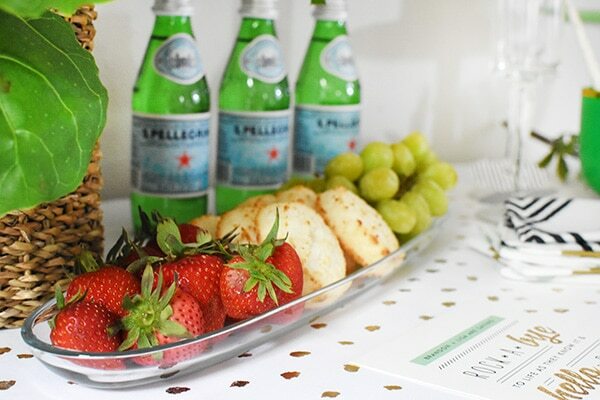 That polka dot runner is my favorite! 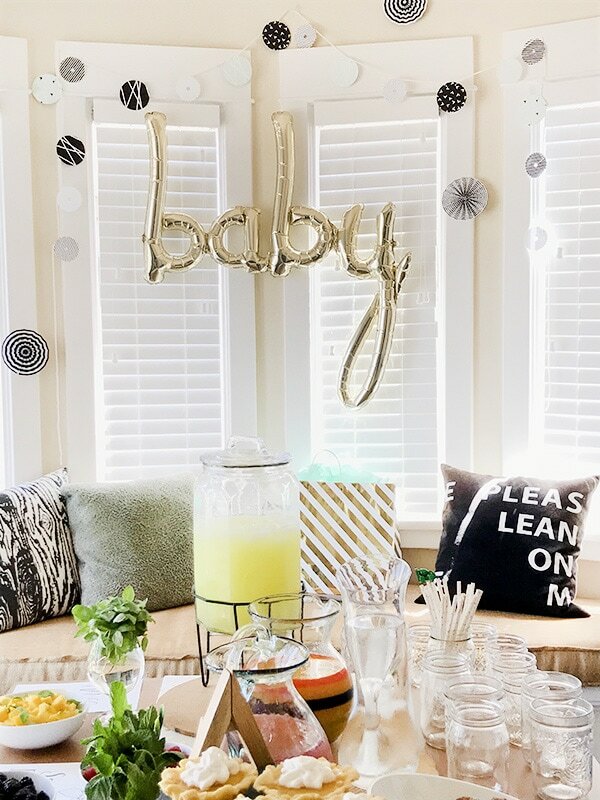 Also love the balloons and the drink station! Darling!!! 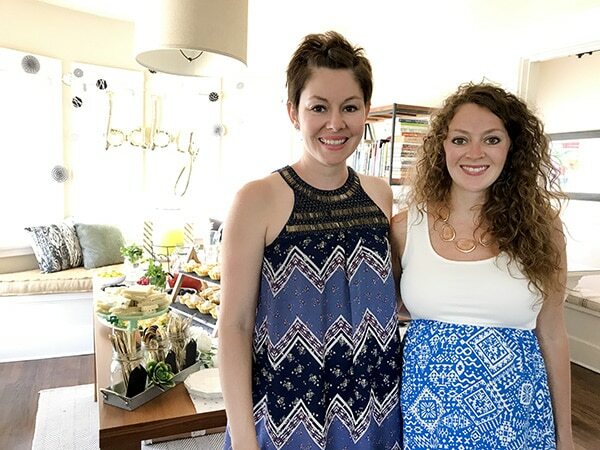 You are going to be one amazing auntie! Ohhhhhhh the sweetness! Love seeing your toes in the cute pics. 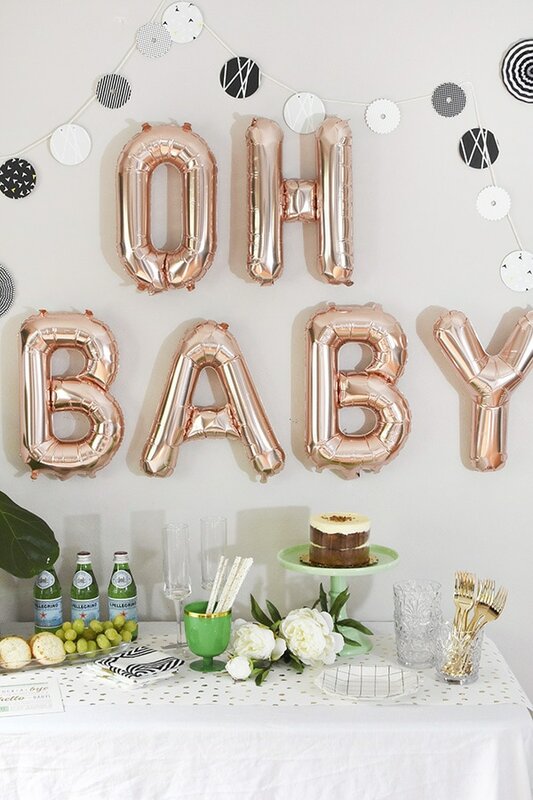 LOVE the decor, the sangria station, the wood place mats, THE BALLOONS! WELL done! And congrats Lisa!!!! Super cute, Amy! 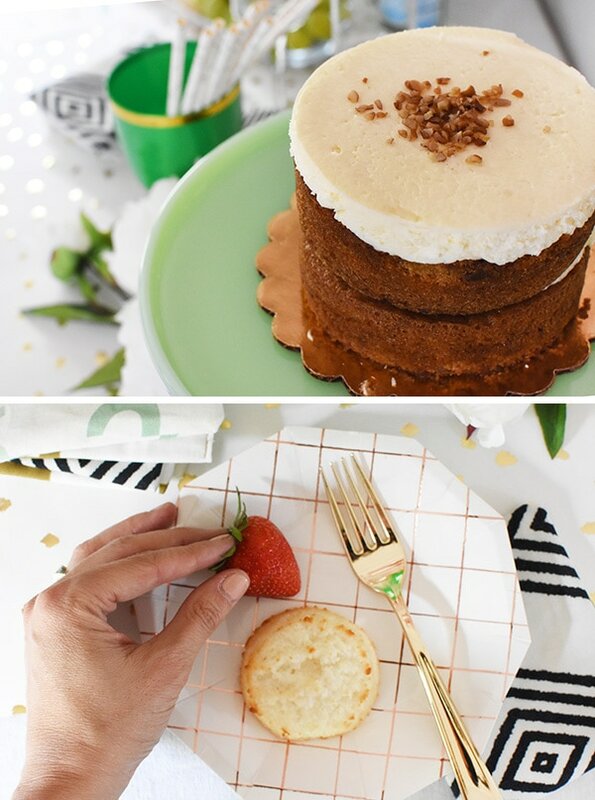 I’ve been wanting one of those green cake stands forever!! Aren’t they just gorgeous! 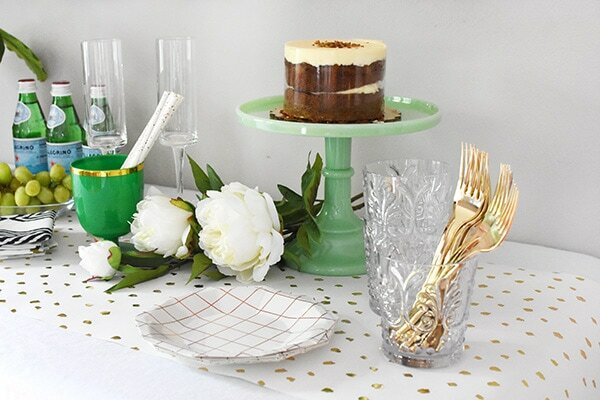 Milk glass is the best and then mint green makes it even better!! This is so sweet Amy! Love how you used a neutral palette. So chic for a shower!